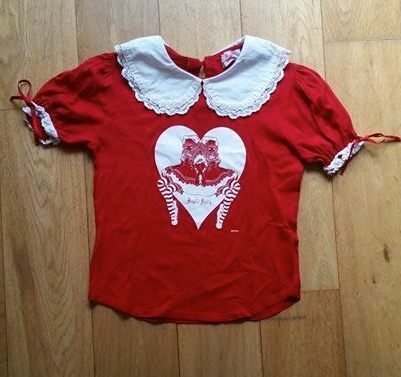 Angelic Pretty Imai Kira Cutsew - Very rare! The cutsew has a thick collar and a hook and button closure in the back of the neck. The lace on the sleeves has a ribbon on each that you can tie into little bows. No returns allowed. Payment is required within 7 days. After I send the item I will email you the receipt. I will hold no responsibility if the item gets lost in the post. Hi! Do you ship to Serbia? If so, could you give me a shipping estimate? Thanks! What would be a shipping estimate to NY, USA, 10454? Hello! It should be around £11.50 tracked!